Many users especially shutterbugs may take a lot of photos or download a lot of digital images from other sources of media which are thence quickly saved into their computer. This photo collection may grow so fast that users have no time to sort them according to relevant categories. This creates a problem for users when they need to look for specific photos or collections. Users may need to spend tedious time viewing the photos one by one if they are not nmeanigfully identified or labelled. The Adebis Photo Sorter can help users to organize their photos into separate folders so that users can access and share them easily with others. Adebis Photo Sorter is a free and tiny photo collection sorter and organizer for the Windows operating system. This application is user-friendly with a simple interface. With this application, users just need to identify the source of the digital images they want to sort and decide on the destination of the organized and sorted images. Adebis Photo Sorter will process the photos from the source identified using the EXIF data found in these photos, copy these photos, and thence organize or sort them according to the sorting criteria that users define in another new designated folder. This application will not disturb or delete the original photos as well as the folder where the photos are stored. Adebis Photo Sorter allows users to organize and sort their photo collection following a few sorting criteria such as date of creation of the photo, photo formats, etc. 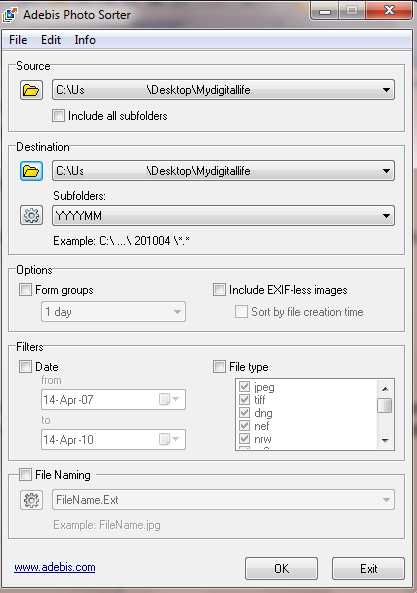 This application supports most of the popular image formats such as JPEG, TIFF, DNG, NEF, NRW, CR2, ARW, PEF, ORF, RW2 and RAW. Besides the sorting feature, this free application also can do batch renaming for users. Users can use this application to do multiple photos renaming based on differences in time. Users who need the sorter to tidy up their messy photo collection can download this application via the link here. This application supports both 32-bit and 64-bit Windows Operating System inclusive of Windows XP, Vista and Windows 7.